This article is about a player position in gridiron football. For the scoring play, see Safety (gridiron football score). For the topic of football medical safety, see Health issues in American football. Safeties are the last line of defense, and are thus expected to be sure tacklers. Indeed, many safeties rank among the hardest hitters in football. Safety positions can also be converted cornerbacks, either by design (Byron Jones) or as a cornerback ages (Charles Woodson, DeAngelo Hall). The free safety tends to watch the play unfold and follow the ball. The free safety is typically assigned to the quarterback in man coverage, but as the quarterback usually remains in the pocket, the free safety is "free" to double cover another player. On pass plays, the free safety is expected to assist the cornerback on his side and to close the distance to the receiver by the time the ball reaches him. Offenses tend to use the play-action pass specifically to make the free safety expect a run play, which would draw him closer to the line of scrimmage, and reduce his effectiveness as a pass defender. Furthermore, quarterbacks often use a technique to "look off" a free safety, by looking away from the intended target receiver's side of the field during a pass play, with the intention to lure the free safety away from that side of the field. This phenomenon often tests how effective a free safety's wit and athleticism are at defending long pass plays. If the offense puts a receiver in the slot, then the free safety may be called upon to cover that receiver. Free safeties occasionally blitz as well. When this happens, the pressure on the quarterback is often very severe since a blitz by a defensive back is not usually anticipated. Because of their speed and deep coverage, free safeties are especially likely to make interceptions. Examples of exemplary free safeties include Larry Wilson (the first to run the safety blitz), Ed Reed, Earl Thomas, Willie Wood, Jack Tatum, Brian Dawkins, Darren Woodson, Eric Weddle, Rod Woodson, Mike Mitchell, Ronnie Lott, Sean Taylor, and Paul Krause. The strong safety tends to be somewhat larger and stronger than the free safety. However, the word strong is used because he is assigned to cover the "strong side" of the offense, the side on which the tight end, a usually big, powerful receiver-type player lines up on offensive plays. The strong safety tends to play closer to the line than the free safety does, and assists in stopping the run. He may also cover a player, such as a running back or fullback or H-back, who comes out of the backfield to receive a pass. A strong safety's duties are a hybrid of those belonging to a linebacker in a 46 or 3–4 defense and those of the other defensive backs, in that he both covers the pass and stops the run. 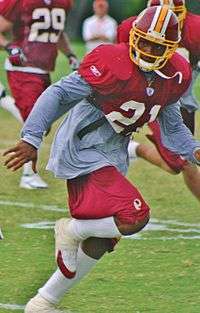 Notable strong safeties include John Lynch, Troy Polamalu, Kam Chancellor, Adrian Wilson, Leroy Butler, and Rodney Harrison. Strong safeties are not seen in the Canadian game, where the role is filled by the two defensive halfbacks. ↑ Trotter, Jim (October 7, 2006). "NFL safety today must fly like wideout, sting like LB". SignOnSanDiego.com. Union-Tribune Publishing Co. Retrieved October 10, 2007. ↑ "Defensive and Special Teams Football Positions". FootballBabble.com. Retrieved 2010-01-30.